Although purists might argue that barbecued ribs are best cooked over charcoal, a propane grill is easier for novices to handle. Keeping charcoal at the low temperature required for ribs is a challenge, requiring skilled manipulation of the vent and draft. With a propane grill, it's a relatively simple matter of turning the burners higher or lower. That means you can focus less of your attention on the grill, and more on preparing the best ribs possible. Good pork ribs require careful seasoning and long, slow cooking over indirect heat. Remove the tough membrane from the back of each rack of ribs, loosening it from the bones with a dull knife and then pulling it away. If it doesn't come off in a single strip, use the knife to pry up an end and then peel off any stubborn sections left behind. Season the ribs with a spice paste or dry rub, then cover and refrigerate them overnight. Fold a double layer of heavy-duty aluminum foil, and place a handful of hardwood chips in the middle. Wrap the wood in the foil, making a compact package, then pierce it in several places with a bamboo skewer. Heat your grill to a cooking temperature of 225 degrees Fahrenheit. If you have a two-burner grill, light only one side and leave the other off. If you have a three- or four-burner grill, light the outside burners but leave the middle off. Lift your grill's grate and place the foil packet of hardwood chips near the flame. Replace the grate, and lay your racks of ribs over the burner or burners that aren't lit. Close the lid. Your ribs will cook gently in the trapped heat from the other burners. Cook baby back ribs for 3 to 4 hours in the gentle heat. Bigger side or spare ribs require 5 to 6 hours. The ribs are done when a rib bone rotates easily if you grasp the end and wiggle it back and forth. The meat shouldn't fall from the bones, but should peel off easily when you bite into one. Brush the ribs with your favorite barbecue sauce, and crank up the heat on your grill to 450 F or 500 F. Cook the ribs for a last few minutes at this temperature to caramelize the sauce and make it stick to the ribs. This step is optional, but adds flavor. Serve the hot ribs as whole racks, half racks or individual ribs, whichever is better suited to the occasion and your guests' appetites. If you opt for a final coating of barbecue sauce, be sure that its flavors are compatible with the flavors in your spice rub or paste. 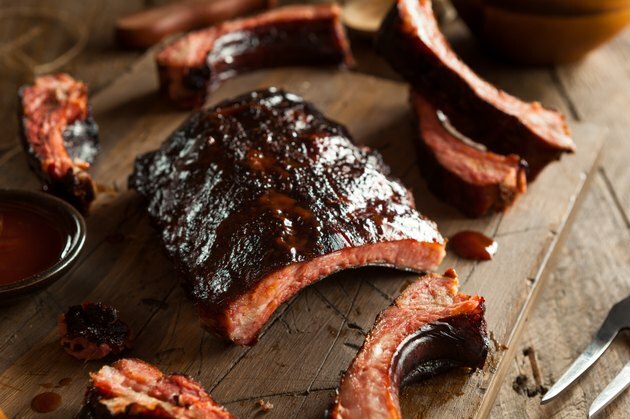 Pork ribs work well with most varieties of hardwood, from boldly flavored oak and hickory to mellow fruit woods. Use the wood sparingly, as too much can give your ribs a harsh flavor. Some cooks like to trim away the thin ends and edges of the rack, which contain large quantities of gristle and tend to overcook. They can be bundled in heavy-duty foil with barbecue sauce, and cooked alongside the ribs for 3 to 4 hours as a separate dish. If you have limited space and lots of ribs, visit your local barbecue outlet for a rib rack. These hold the ribs vertically, so you can fit up to six racks into the space taken normally by two or three. This will extend your cooking time by 15 to 20 percent, but greatly increases the number of ribs you can prepare. Amazing Ribs: Last Meal Ribs -- The Best Barbecue Ribs You've Ever Tasted!